The expended Saturn IVB stage as photographed from the Apollo 7 spacecraft during transposition and docking maneuvers at an approximate altitude of 125 nautical miles, at ground elapsed time of three hours and 16 minutes (beginning of third revolution). This view is over the Atlantic Ocean off the coast of Cape Kennedy, Florida. The Florida coastline from Flangler Beach southward to Vero Beach is visible. Much of the Florida peninsula can be seen. Behind the open panels is the Gulf of Mexico. 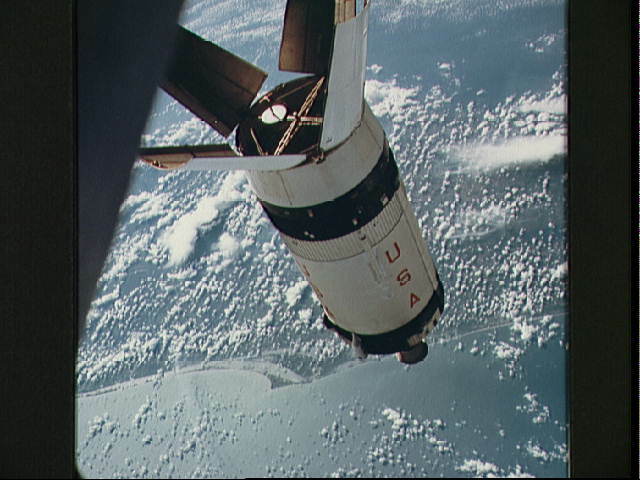 Distance between the Apollo 7 and the S-IVB is approximately 100 feet. The round, white disc inside the open panels of the Saturn IVB is a simulated docking target similar to that used on the lunar module for docking during lunar missions.